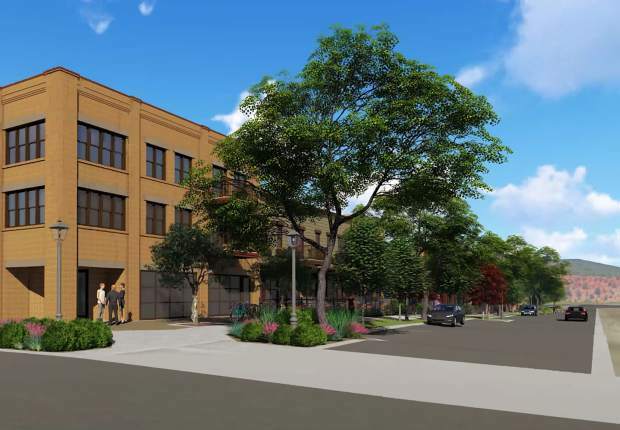 An architectural rendering depicts the design for the new Carbondale residential neighborhood near the soon-to-be-built new City Market on West Main Street. An architectural rendering depicts the design of the new Carbondale residential neighborhood that's part of the new Crystal River Marketplace property development. 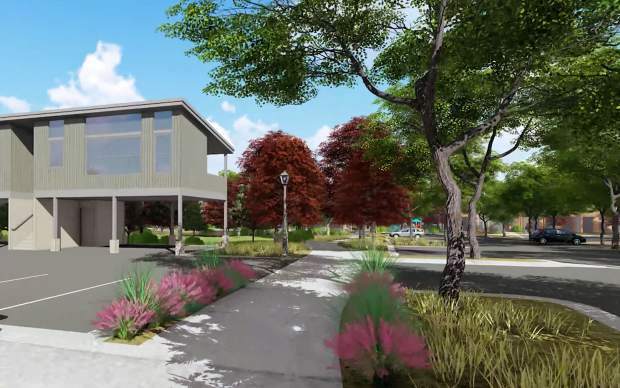 The Carbondale Board of Trustees approved site plans and architecture for 115 new residential units on West Main Street Tuesday, with a notable lack of public resistance on a historically controversial property. “I was a little surprised that there was nobody,” Mayor Dan Richardson said of the lack of public involvement in the meeting. Given the intense interest in the development with the whole area, which includes the new City Market grocery store being developed, he expected more public involvement. Known as Lot One or Main Street Marketplace, the area, owned by Crystal River Marketplace LLC, will have a prominent place west of the Highway 133 and Main Street roundabout, and northwest of the Hendrick Drive intersection. Developers hope to begin construction around the time that the new City Market building to the north starts going up in 2019, Bob Schultz, lead consultant on the project, said. Presenting the designs to the trustees Tuesday, Schultz commented that a common criticism of Carbondale is that, when it comes to development, the town doesn’t know what it wants. That’s not true in this case, said Schultz. The Marketplace property has a long history, involving two different large-scale commercial and mixed-use planned-unit-development proposals during the past 15 years that went to referendum elections and were shot down by town voters. After all that, “The town spent a bunch of money and a bunch of time, and a bunch of people, to come up with a comprehensive plan,” Schultz said. The consultants, architects and designers on the Lot One project took great pains to follow the town’s Unified Development Code, adopted in October 2017, in spirit so they wouldn’t have to ask the board for exceptions. “It sure feels like the UDC is working like a charm,” Richardson said. The board thanked the designers for working from the codes rather than against them. Rectangle buildings are the cheapest to build, but that isn’t allowed. “What I liked about it was that it was very clear, and was generated by the town and the people who live there,” Schultz said. For the team at Poss Architecture and Planning and Interior Design, the codes fit with a lot of what they already wanted to do with the site. “The necessity to break up the facades, use multiple materials, and have more of an organic feel, like how something might develop as a neighborhood over time, played into what we were envisioned anyways,” Andrew Wisnoski, a partner at Poss, said in an interview. “We simply followed what was in the code, but I don’t think we found it to be restrictive in any way,” Dave Ritchie, principal at Poss, said. The design team wanted to create a sense of community with common activity space in the center of the lot and parks and playgrounds, and even space for artwork along some of the walkways. “I really liked the sense of community, the way we’ve captured the common activity space in the middle,” Wisnoski said, adding that it’s a place he’d like to live. “I think my kids might even be able to afford to live there,” he said. From the choice of materials to the design of the walkways and the variety of buildings, as the lead firm, Poss wanted to make the lot look like it developed organically, and looked for opportunities for iconic buildings. The project did ask for certain variances, which the trustees granted unanimously. The developers had to ask the town to waive the requirement that buildings be built no more than 10 feet from the sidewalk to accommodate the Rockford Ditch and its 20-foot easement that runs along the north side of Main Street through the lot. The lack of public involvement in the Tuesday meeting does not mean that the public didn’t have a chance to weigh in on the project. Schultz has held open houses and taken public comment informally as well. “People have had a chance to offer comments and suggestions, and most of it was pretty positive,” he said. Most of Carbondale sees housing as a critical need, and providing more spaces, some of them affordable units, is something the community genuinely wants to see. Many of the new units will be small, which Trustee Marty Silverstein says is key for keeping rental costs low, and allows young people and the elderly the ability to stay in Carbondale rather than move down valley. “I think they’ve done a really good job of reading the market, and hopefully the price point will be such that it’s successful for you and for the town,” Silverstein said. All the units will be rental properties of various sizes. Three of the 11 buildings will provide around 10,000 square feet of ground-floor commercial space, and an additional 9,600 of office or other commercial space. The board also granted developers leeway on the number of street trees. The town’s code requires a certain number of street trees based on the length of the front of the lot, but the developers sought to limit the number of street trees to allow room for trees to mature. Carbondale’s Tree Board will have a chance to approve the final placement of the trees on the site. The next step is to finalize a development improvement agreement, which will make certain stipulations about the construction process. Schultz hopes to begin vertical construction in 2019, around the time the City Market construction gets moving, and have rental units available as the new store opens. Beyond that, the market will dictate when the rest of the buildings are erected. Empty buildings should be avoided, but the town also wants to avoid unsightly construction. The trustees want to make sure that certain parks are installed before all the buildings go up. “I want to make sure that as it goes up in parts and pieces, there’s an appropriate level of public infrastructure that the residents and the general public can benefit from,” Richardson said.